To be eligible for Citizenship you need to Be a Legal Permanent Resident (Green card Holder) for at least 5 years, (or) 3 years if you are married to a U.S. Citizen. WHAT ARE THE BENEFITS OF CITIZENSHIP? Find out why you should apply for citizenship, and whether you’re eligible. The Citizenship process can feel overwhelming, but you don’t have to do it alone! Our trained staff and volunteers can assist you navigate this process. We need dedicated volunteers to make our events a success. Join our volunteer list to learn about our upcoming workshops and volunteer! In order to ensure efficiency and timeliness, we ask that you begin submitting your information online through our Citizenshipworks portal. When you come in person for your appointment, our legal team will access your information and make any necessary changes. If you do not have access to a computer or need help, please call us at (312) 949-9980. Click the green button, Start your application now! Create an account (You can create an account using your cell phone number or email). Write down your username (cell phone number or email) and password! Complete as much as you can before your appointment date. Please make sure that you answer each question truthfully and honestly. After you are finished, please send an e-mail to services@uniteafricans.org. Our legal team will be able to assist you if you have completed 90% of the application, and referred to our drop-in hours/workshop. Ensure that you have all necessary documents to bring with you for your appointment. • Logistics AssistantYou will have an invaluable opportunity to network with many others who give their skills and talent to empower immigrants and refugees. This opportunity requires availability for 3 -5 hours per month. 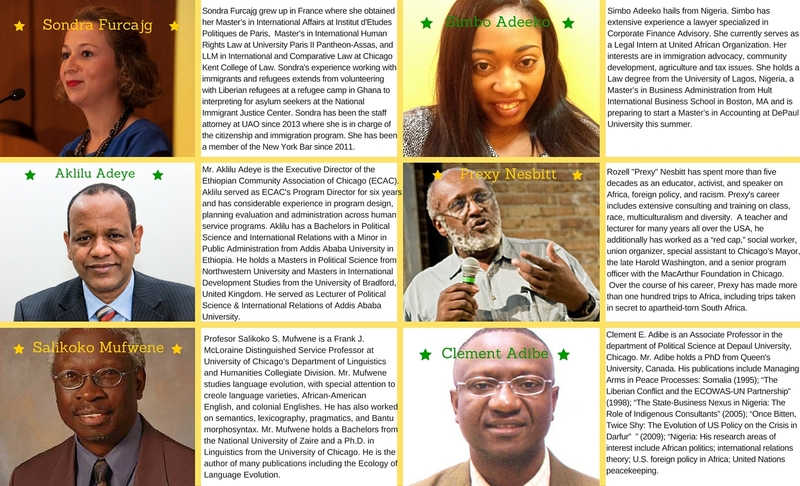 Contact us at (312) 949-9980 or volunteer@uniteafricans.org and become an invaluable resource in providing access to immigrant integration services! Our free citizenship workshops are provided with support from the New Americans Initiative, and takes place once a month, on either a Saturday morning or weekday.We encourage law students, immigration attorneys, paralegals, and others with legal experience to participate.United African Organization (UAO) relies on volunteers to support our initiative, programs and events throughout the year. Sign up for our next workshop or join our volunteer list! 1. I need to apply for naturalization to become a US citizen. What documents should I bring? 2. I am a US citizen. I want to apply for my children to become US citizens. What should I bring? 3. I can’t afford USCIS fees. What should I do? YOU MAY QUALIFY TO APPLY FOR CITIZENSHIP AT $0 COST OR AT A REDUCED FEE OF $405! 4. How long should I plan to stay at the workshop?. Expect to stay for at least 2 hours. The annual Chicago African Summit and Community Resource Fair returns to Bronzeville, Chicago for a one-day forum for reflection, engagement and networking as we grapple with critical issues facing the African immigrant and refugee community today: immigration reform, refugee resettlement, affordable housing, employment, healthcare, and role of the diaspora in promoting democracy and providing humanitarian assistance. The event includes a Community Resource Fair that provides information about employment, immigration, legal services, housing, health screenings and other resources for participants. Click here to participate as a vendor. Imagine this: One unique space with special focus on contemporary African issues, public policy advocacy, and community empowerment. Connect with information and resources on employment, immigration, legal services, housing, health screenings and other at the Community Resource Fair. 1. 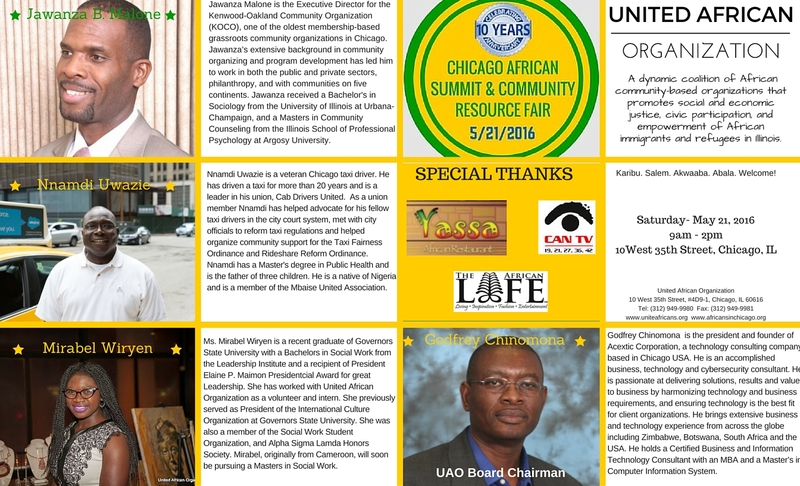 When and where is the Chicago African Summit & Resource Fair? 2. How much is the registration? Registration is FREE. Click here to Register now!. 3. Can I bring a guest? 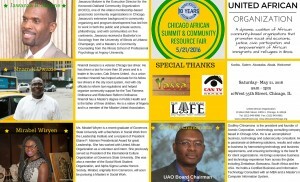 We welcome you and guests to the Chicago African Summit & Resource Fair. However for planning purposes we encourage all attendees to register. 4. Will there be Internet access? Yes, complimentary Internet access will be available. 5. What should I wear? Attire is business casual. Feel free to dress in traditional African attire. 6. How can we participate in the Resource Fair? 7. How do I update my registration details? Email events@uniteafricans.org or call 312-949-9980. In observance of Memorial Day, UAO offices will be closed on May 27, 2019. In observance of Independence Day, UAO offices will be closed on July 4, 2019. In observance of Labor Day, UAO offices will be closed. In observance of Thanksgiving Day, the UAO office will be closed on Thursday – November 28th and Friday- November 29th. In observance of Christmas and New Year holidays, the UAO office will be closed from Monday December 23, 2019 until Wednesday- January 2, 2020. Enhance core programs that further the mission of the UAO.